You know that it is bound to happen sooner or later, your doggie kid will get an upset stomach. It usually only last for a short amount of time, but as parents you want to help ease their tummy's. Fast your dog. Remove their food bowl and limit their access to food. Let their stomach settle. This does not mean starve, but if the are vomiting everything you give them, give them a chance to rest. If they can not hold any food past 12 hours, consult your veterinarian. Try some plain boiled rice and chicken, no spices and no skin on the chicken. Give them 1 to 2 tablespoons of pumpkin puree. You can use canned pumpkin, but make sure it is not pumpkin pie puree. Pumpkin is high in fiber, which helps in digestion and elimination. Given them 2 to 3 tablespoons of plain yogurt. The good bactria in yogurt helps to add in digestion. Keep them hydrated. If they can not keep down water, try filling their water bowl with ice chips or cubes. 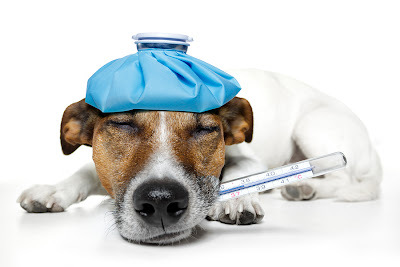 Please remember, don't treat your sick dog at home, if they are lethargic, have server diarrhea, vomit continually or have blood in their stool. Take them to a veterinarian as soon as possible.